While the ZTE Grand Memo decent it isn't the best in its class: the Optimus G Pro and Galaxy Note 2 are still the two standout devices. The Grand Memo could do well if it is priced lower than its competitors, offering customers a massive screen on a budget. 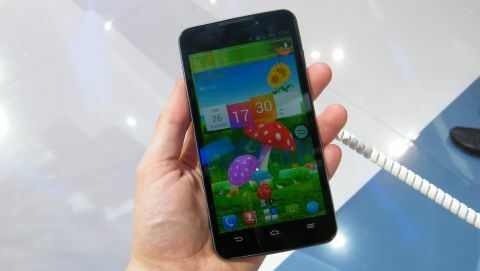 It slides in at the top of the ZTE range, as the Chinese firm looks to extend its high-end mobile offering after it launched the Grand S last month at CES 2013. ZTE expects the Grand Memo to go on sale during the second quarter of the year, however an exact release date and price are yet to be announced. The main attraction on the Grand Memo is its large 5.7-inch display - which features a 1280 x 720 HD resolution - dominates the front of the device, but there's a sizeable chunk of bezel above and below the screen adding extra length to an already big handset. It puts the Grand Memo up against the likes of the Samsung Galaxy Note 2, LG Optimus G Pro and Huawei Ascend Mate. This bulk makes it a little unwieldy in the hand and we found ourselves really having to stretch our fingers to properly grasp the Grand Memo. Design wise the Grand Memo is pretty standard fare, with the now familiar slab of glass on the front coupled with glossy plastic on the rear which offers little in the way of grip - something you really could do with on such a large phone. At least ZTE has managed to keep the thickness down, cramming an impressive amount of tech into the slender 8.5mm frame. The screen itself is bright and clear, although on closer inspection its not the most detailed of displays we've had the pleasure of ogling and you may want to consider the full HD Optimus G Pro or the smaller Sony Xperia Z and HTC One. ZTE has employed a rather hearty overlay onto the Android Jelly Bean OS, with a lot of 3D animation in play as you slide between homescreens and flick through the app list. These animations are a little annoying however and means operation is slowed down as they perform their various actions. It's disappointing as we reckon the 1.5GHz quad-core processor and 1GB of RAM inside the Grand Memo could make mince meat of the stock version of Jelly Bean. Some of the animations can be switched off in the settings menu, but some still remain and that irks us somewhat. As with Huawei, ZTE can be accused of making its Android UI look a little bit childish, and we'd much prefer the clean cut Google icons to the more cuddly ones we get on the Grand Memo. Aside from the animations getting in the way the Grand Memo is pretty nippy everywhere else, with apps opening promptly. There's only 16GB of storage inside the ZTE Grand Memo, but thankfully a microSD slot resides under an easy to remove flap on the left side of the handset, as do the microSIM and microUSB ports. You'll find the power/lock key located on the top of the device, which can be a little tricky to hit if you're holding the Grand Memo in one hand as you usually need to shuffle it down a bit to reach. ZTE has packed some of the latest connectivity tech inside the Grand Memo with Bluetooth 4.0, Wi-Fi 5.0GHz and 4G all present and correct, although we were unable to test the internet speeds due to a lack of connection at the booth. NFC hasn't been included here and we suspect it has something to do with ZTE wanting to keep the body of the handset slender. A 3,200mAh battery resides inside the Grand Memo which should hopefully keep you going for a day, but we worry about those over the top interface animations draining unnecessary juice. The Grand Memo is also well equipped in the camera department with a 13MP snapper and LED flash round the back, while on the front you get a 1MP lens. The camera app has a simple layout which is easy to use and the shutter speed is suitably quick which meant we were able to snap photos in succession without having to wait around. Modes such as HDR, panorama and burst are all present and correct along with a variety of effects and the option to record 1080p video. We weren't overly impressed by the picture quality on the ZTE Grand Memo with images seeming to lack clarity and moving objects appearing blurry. We're starting to become spoilt for choice in the "phablet" market as more and more manufacturers decide to jump on the super sized smartphone band wagon. While the ZTE Grand Memo is a decent handset it isn't the best in its class, with the Optimus G Pro and Galaxy Note 2 still the two standout devices. The Grand Memo could do well if it is priced lower than its competitors, to offer customers a massive screen on a budget, but if ZTE looks to match the cost of its rivals it could spell trouble for this tabl.. sorry, smartphone.